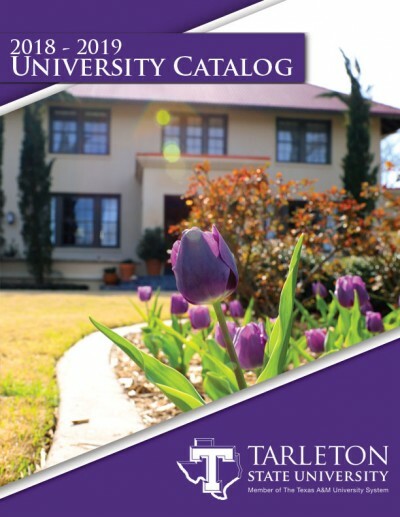 Courses for the year can be found in the catalog published by the university. Photo courtesy of tarleton.edu. Tarleton State University added 13 new minors to the catalog for the fall 2018 school year. The minors are: agricultural communications, agricultural mechanics, animal science, child development and family studies, counseling, civil engineering, electrical engineering, legal studies, mechanical engineering, music business, range and ranch management, Spanish, and social work. Some minors, like Spanish, have already been in the catalog, but specific classes have been added to the minor. “What’s new is specifying the classes that must be taken for the Spanish minor. The minor adds an extra advantage to your resume, particularly in Texas,” said Dr. Ivelisse Urban, assistant department head of English and Languages. Another new minor is child development and family studies. This minor was created to, “prepare students to be able to work with children in situations that they may need assistance,” said Dr. Deborah Banker, department head of curriculum and instruction. The music business minor was created to “help students understand the [music] industry, because if you don’t understand the industry, you’re gonna have a hard time working in it,” said Dr. Douglas Tejada, assistant professor of fine arts. Those interested in the new minors can find information about each minor in the class catalog.